The cake that got me back on my feet. Literally! Standing in my kitchen, with cameras and filming again for my blog, YouTube and Insta was a mammoth task both physically and emotionally. After 6 months off from filming, I was beyond nervous to switch on the cameras. But we are now officially settled in our home. I’ve done a super fast and cheap reno in the kitchen (more about that another time), unpacked and found where all the camera equipment is, and made the decision to just go for it, and hope that it all works out. If I’m being honest, I’ve always hated where I’ve been filming. I’ve created fake kitchens, worked out of our real kitchen, done top down ‘Buzzfeed style’ videos. But I’ve always thought the colouring of the videos looked horrid. Even after outlaying as much as a car on cameras, I was left feeling disappointed with the end product. But now, in our own space, I have my dream filming kitchen! So much light, a glorious oven, and after painting the cabinets white, the whole space just turned out looking fresh and vibrant. Of course that meant that the first cake I filmed had to be a good one. 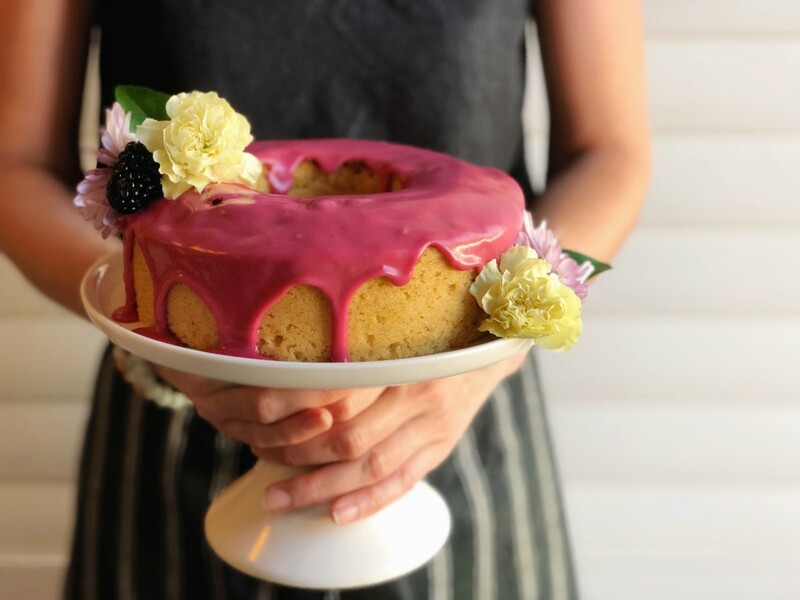 Now I’m an old fashioned gal when it comes to cakes sometimes. I love the simple Madeira cakes and light fruit cakes of my childhood. Of course back then the cakes were store bought, but hey, sweet tooth’s gotta eat! The thing I love about a Madeira cake is the density and the moisture. It’s hard to describe the texture, it’s firm but soft all at the same time. This is my autumn version of that cake. Packed with citrus, a dash of spice, and the almond meal just gives that perfect density I was looking for. 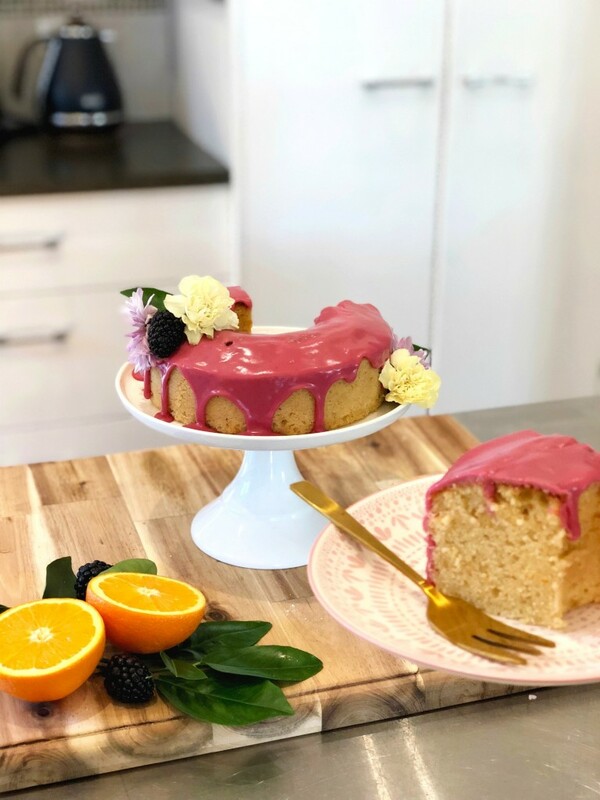 I trialled a roasted plum glaze on this cake a couple of weeks ago, but the flavour kind of got lost, and ended up making the cake very sickly. So I spent quite a few days stumped for what would be the best pairing to compliment the orange. Then I realised that the answer was sitting in my fridge the whole time! Hubby was given a delicious homemade blackberry jam from a client a couple of months ago. It’s his favourite flavour of jam, so of course we had to crack that open right away. The lady had added orange zest and star anise to it, and seriously turned it into the most amazing warm flavour I’ve ever had in a jam. It was enough to make me want to start making jam (add that to my list of things to make lol). Preheat oven 175°C/ 350°F. Butter and flour a small ring tin or loaf pan. Combine the flour, almond meal, baking powder, salt, cinnamon and cardamom in a medium bowl. Add the eggs and orange rind. In three parts add the flour mixture and the orange juice, starting and ending with the flour. Bake for 40-45 minutes, or until it springs back when touched. Allow to cool for 10 minutes, and then cool on a wire rack for at least an hour. Cut and press the blackberries through a sieve to extract the juice only. Add icing sugar to the juice until you get a medium stiff consistency. You should be able to smear it over the bowl and it will eventually relax back into itself. 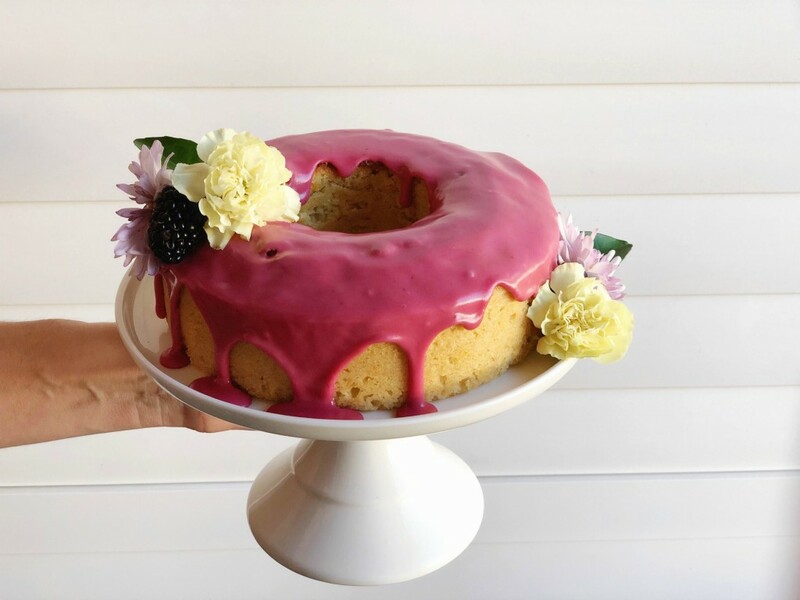 Glaze the cake with the icing. 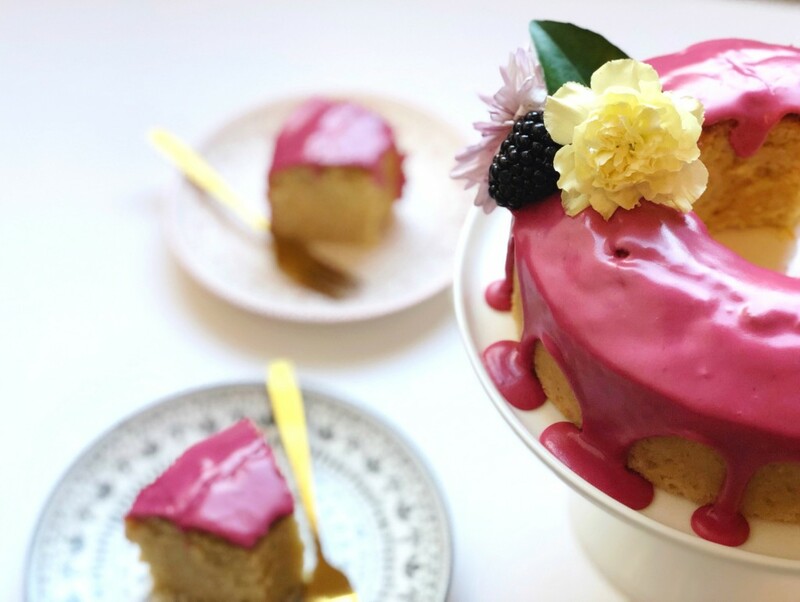 This cake can be left at room temperature for 2-3 days.